This is the seventh post in my 'Investing in Real Estate' series and will answer the question: How do I negotiate the price of my house. The last thing we covered in the series was information you should know before you negotiate so I am going to presume at this point that you have some or all of that information. There are many different approaches to negotiating for a real estate investment. A lot of this has to do with your personality. I (probably like most people) am not really comfortable playing hardball and I get really frustrated with games so the method I outline below is the simplest way to negotiate for your property which allows you to walk away relatively quickly and easily if your offer is not accepted. Never ask the real estate agent what the price is. You come off as an amateur if you do this and the real estate agents tend to walk all over you. Do your own research into comparable sales and how much you think the house should be worth. If you have managed to get how much the owner is willing to sell it for (see my previous post again) then this is a redundant question anyway. Never get emotionally involved. This is an investment - always remember that. People pay too much for personal residences because they get emotionally involved in the property. If you think of a property like any other investment you will not get too attached. I promise you that no one gets emotionally attached to a particular savings account. The way you dress is important. I think people often forget this one. What you want when buying a property is to give the impression that you can afford it relatively easily but not that you are so well off that you can afford to pay over the odds. This ensures that your offer gets noticed but you do not get scalped. Tracksuit pants is unacceptable but going in a suit is going to sink you as well. Be confident and ask all the necessary questions up front: Again this comes down to establishing the power in the negotiation. If you are confident the other party is less likely to play games with you and asking the right questions up front ensures that they know that you know what you are talking about. Make all offers in writing.In many jurisdictions real estate agents have an obligation to take all offers in writing to the vendor. With verbal offers you have no idea if the offer actually has reached the vendor and you often end up bidding against yourself. Include all conditions that you want in your original offer: This includes conditions like building / pest inspections as well as finance clauses and other get out clauses that you require. Note that the more get out clauses that you put in the less attractive your offer becomes. Some conditions can make your offer more favourable though. For example if you offer a shorter settlement period then a vendor is more likely to look favourably upon your offer. Never forget that there are heaps of good investments out there and that perfect investment that you missed out on because you 'didnt offer enough' will be replaced by another. I made offers on four properties before I bought my first one and people often go through the process many many times before they get one that works for them so keep trying. I'd be interested to know if anyone has other tips of negotiating for investment properties so if you do please comment and I'll be happy to update my advice above. The hardest thing to do as an investor is to invest against the market. There is a certain comfort in doing what everyone else is doing - the 'pack logic' for lack of a better expression. However the really good returns from investment don't come from these investments - they come when you have gone against the market. The catch in the above statement is that the market needs to have been wrong and you need to have been right. As this is an unknown it requires conviction on your behalf in your valuation thesis and in your own abilities. I was watching a documentary recently on Warren Buffet and almost everyone has heard of his concept of 'Mr. Market'. That the best time to invest is when the market is offering you a price that is either too high (that is when you sell) or too low (when you buy). Underlying the ability to take advantage of this is an investors conviction that they have done the legwork and have the 'fair price' in their mind. While the concept seems rather simple and easy to follow, in practice it can be quite difficult which I know from personal experience. I was invested in the US S&P500 index last year because I thought the market as a whole seemed cheap because sentiment there was terrible (and I had the benefit of not living in a country and share market that was experiencing a bull market) and the exchange rate was working in my favour. I invested in this market however a few months later saw the value of my holdings slide ~10%. I actually knew that this made the price of the index ridiculously cheap and I should have piled more money into it. However I didn't because I found it too hard to swim against the tide of negative sentiment. It is even harder when you are talking about a more risky investment (e.g. a micro cap stock) because this is when the thought of throwing 'good money after bad' keeps entering your mind even though you have done all the necessary analysis. Note that it is just as hard to stay out of the market when you think it is overvalued. This is because as it keeps going up you are acutely aware that others are making money in the market and perhaps you should be as well. If you can develop an internal fortitude though and an ability to ignore sentiment then you can profit handsomely. Note that this comes with a big caveat - often the market is right and you are wrong and you need to be willing to admit that you are wrong and exit bad trades. Their tabs system for both trading and getting statements was terrible. It would take much longer than was necessary to find even basic information. However in the last month interactive brokers has overhauled its user interface to make it much more user friendly. When I logged onto the account management part there was a section for me to go to the full webtrader, or if I wanted to I could just put through a quick trade. Further the options were easy to navigate and everything was in a logical place. Although this update was well overdue it makes the system a lot more user friendly (especially for those who are not full time traders). This combined with the unbelievably low trading costs (especially for stocks listed on international exchanges) means that in my view interactive brokers is now the best broker in the market by a long way. Note that although I believe it is the best broker out there 'on balance' this does not mean that the system is perfect. My major gripe with interactive brokers is still the fact that a trader is unable to participate in dividend reinvestment plans through interactive brokers. How do I research shares? This is a post for beginners on how to research shares you may want to invest in. I wrote this post because a friend of mine (who does not invest regularly) sent me a list of 4 shares she was considering investing in but it turns out she had not done any research in the companies and didn't know how to. You do not need to read the whole report in detail - but reading a number of reports from the same company will give you a feel of the company as well as what is important to it and what drives its results. Broker reports with their 'buy' and 'sell' recommendations should never be taken at face value. Brokers are right as often as they are wrong. You are using their reports to get a better understanding of the company you are looking to invest in. The danger in this is that we are looking for information which proves our thesis. I prefer to search for information which disproves my thesis to make it easier to cut companies where the investment does not stack up. All of this research may sound like a lot of work but there really are no shortcuts. If you start taking shortcuts then you have less of an understanding than the next investor in the market which puts you at a disadvantage. I recommend doing the above as a minimum amount of research. If I have missed anything let me know and I'll add it to the post as I am hoping this will be a useful resource for beginners. Just a very quick post from me today on the risk of investing in Chinese companies. This article, which first appeared on bloomberg, is a great summary of the problems associated with investing in China. The biggest problem investing in Chinese stocks is the lack of transparency. All the advice that people give about doing research etc. about your companies, and reading the reports carefully and keeping up to date are useless if you are being lied to. Many Chinese companies (as outlined in the article) have had their auditors resign and / or have had to delay releasing their results over disputes with their auditors. Try and reconcile company reports on how they are going with the broader Chinese market. If you are investing in a small company try and find big reputable companies that are operating in the same space and see what they say. Basically you are trying to find reasons not to invest in the company. If you don't come up with anything substantial then consider going ahead and investing but always keep the risk in the back of your mind and acknowledge that you are getting a higher return for taking a risk that others are perhaps not prepared to take. This is the Introduction to a series which will follow in real time my attempts to make money in the world of 'small business'. Because this is a real time series I suspect the posts will be less frequent than my other series (such as my real estate investment series) as I will be updating my progress as I go through the experiences. I am probably trying to start a business for different reasons to most. Some people are trying to replace their job with a business or are trying to earn significantly more money than they could from their job. I think I am one of the lucky people that (currently anyway) truly loves their job. I am not looking to replace it - I am looking to see if I can create another income stream (in addition to paid work, passive income from my stock / real estate / cash investments). I was particularly motivated by the book The Adventure Capitalist by Connor Woodman (I have linked to it below) when he sells all his possessions and goes on an around the world trip seeing if he can double his money in a year by buying and selling goods around the world. It is a simple concept and one I want to see if I can replicate for myself. This is the sixth part of my investing in real estate series and with what you should do before you start to negotiate the purchase. Now that you have determined the house (or if you're lucky enough - houses) that fall within your investment criteria and the price you are willing to pay for them you are left to negotiate the price - however this is a lot of information you need before you begin this process. It is actually a lot easier than you think to get a lot of this information (especially if you are willing to spend the time and effort). What price ranges of properties are you looking at? How much do you like this property? Where do you work / what do you work as (they will back solve to how much they think you can spend)? Getting the information you need is easier than you think! Although real estate agents are working for the vendor they are as susceptible as anyone to letting things slip. In fact as many are just trying to make a sale at any price they will often tell you things they know you shouldn't just so you put a bid in. Do not ask these questions as a list as it will put a real estate agent on notice that you are fishing for information they shouldn't give out. Work it into your conversation. A lot of real estate websites will reveal some of the information you need as well. An annoying trend in real estate advertisement is the price reads $POA (price on application) which means you have to contact the real estate agent. There are ways of getting around this and seeing what the sellers ideal selling price would be (no seller puts what they actually expect). On www.realestate.com.au if you right click and select "view source" and then search for the word "price" it will come up with a price band that the website uses to rank their search results. Other websites are like this as well so it is always worth giving it a go. Price the vendor is willing to sell for: Agents regularly under quote what the vendor actually wants to get people interested. Why is it worth being cautious about price comparison websites? While price comparison sites should theoretically be impartial regarding their outcomes there is often the suspicion (and I have heard as much from several insiders) that many sites are incentivised to promote certain companies and products. Moreso some will not list companies who do not pay them. The worst examples I have seen of this are web hosting comparison sites - have a look at a few and you can tell who their main advertisers are from their search results. While I am not suggesting that all or even most sites are like this, the fact that you will rarely know is sufficient enough cause for the consumer to be wary. How should I use the sites? Where the sites really do become useful is as a starting point for further investigation. For example for flights between two locations it is worth using an airfare comparison website to find out which airlines fly between these two points (especially for international flights) and then go to the airline website to book through there. Most often you will no longer need to pay the booking fee charged by the price comparison website. What type of products are best suited to these sites? Price comparison websites are best used for homogeneous products (i.e. the product does not differ greatly from supplier to supplier). I would argue that interest rates are the best example of this while insurance (as I have mentioned several times before) should rarely be bought on price alone as the reputation of the company regarding claims is almost as important. While there may be trustworthy price comparison sites out there it is always worth having a certain level of scepticism / distrust so that you do not get caught out by the dodgy ones. I suggest always looking at the main companies websites and make your own price comparison list (which you will often find yields you better outcomes than the original price - it also avoids the fee that many of these sites charge when you book through them). Investing in real estate: Is it a good deal at THAT price? This is the fifth part in my Investing in Real Estate series. By now you are at the stage of weighing between several different options. This post attempts to outline how to work out if the property you are going for is a good deal / the right price. Don't look at net returns. There is a remarkable amount you can control between gross and net. At the moment all you are looking for is the average rent in the area you are looking to purchase (remember from the last post we have narrowed down our search to a few surrounding suburbs) and the prices of those properties. A big caveat in this step is not to be lazy. Don't just get the median house price and the median rent. If you are looking at 3 bedroom, 2 bath houses then get the rent for those houses (same goes for apartments etc). This is by far the hardest step. Historical growth rates typically mean very little and in all honesty you can be as analytical as you want but because growth in home prices are typically determined by sentiment (especially among home buyers who do not have return criteria) as well as things like government policy, incentives, job availability, gentrification etc it is really hard to get an accurate number for this. People have unrealistic returns for investments which is why they are surprised when they find they their 'high return' investments also have high risks attached to them. If you moderate your investment expectations you will find yourself making better investment decisions. For investment properties I want my return to be 8 - 10% net return. Find out what the typical costs are for an investment property of your type in your area. No rules of thumb here - you really need to be doing the work here. Don't listen to books that give you broad brush answers. ALSO do do this in excel - it's an iterative process and you will need to change the purchase price until it falls within your return! Thus at this purchase price the investment is within the criteria. This is why doing it in excel is so important. If it did not fall within your criteria then you would need to adjust your purchase price until you got to a one in which it did. It is fairly easy to set up a basic excel file to do this. If there is sufficient interest (through comments etc) I will post one online so you can play around with the assumptions yourself. In a previous post I outlined the benefit of share purchase plans and how they were often a great way to make 'free' money. The example I used was the SPP that I was then participating in - the QBE SPP. This particular plan allowed you to apply for more than your proportionate share and as the price of the share was trading above the SPP price it was as guaranteed a profit as one could normally get. While the loss was annoying and not substantial, compared with the expected profit it was quite a big variance. I did a bit of research and such a big scale back is almost unheard of so I was a bit unlucky with this one. The rationale for investing in SPP's still holds however the lesson from my experience here is that you should always keep in mind that a massive scale back like this can result in a loss for the investor. What budget do I have for this investment? What yield am I looking to get? What is the amount that I can afford to invest in this one investment? (note that this is very rarely the maximum you can afford). Once you have this price get rid of all areas with a median price above your price point. I don't necessarily believe that you should buy around the median like some authors teach but simply that you're more likely to waste your time on properties that are out of your price range. Try and target renters areas. There are some areas that are typically inhabited by renters and have a high number of rental properties. This is a good thing! Areas such as those around colleges / universities or even those which tend to have yuppies or young families tend to have a constant level of demand. Call every agent in the area and let them know what you are looking for. Also tell them that you are not interested in anything that doesn't fit your criteria. They will get the idea that your a serious and experienced investor (even if your not) and you'll only get shown relevant properties. Go and look at every property which fits all of the above requirements. You're now at a stage where it is not wasting time any more to look at every property because you know exactly what you want and you know what is good and what is not. If you follow the above 8 steps it will save you a lot of hassle in the property search process. You may not get the perfect property even if it is for sale because there are always going to be people that will pay more / too much. In my next post I will outline the negotiation process. While I do possess some of these (such as a stamp collection I inherited from my great grandfather) it has never been for an investment type purpose. The more I thought about these types of investments the more I became convinced that although you may get good returns on them they were inherently risky for several reasons. If you are investing in these items you have to be doing so full time. While I (and I imagine most people) would like to think that we are are good at appreciating a piece of art I have no special knowledge about what the demand for such a product may be in the future or where tastes are trending. Some people are blindly willing to trust valuers of reports which say what is going to be in vogue in the future but that is much like blindly trusting a broker report or hearing stock tips on the street. I have said it before but you should fully understand every investment you own. Gold and precious metal investment is a field that is very hard to get ones head around as there are so many things that impact the price of these products. If I use the example of gold - it is so hard to forecast with any accuracy the type of return you can expect from an investment in gold. Not only is the supply side hard to forecast (i.e. how many more gold deposits are there to be found) but the demand side is impacted by so many different things such as the level of hedging (which itself is impacted by general sentiment, the value of the USD etc), the level of speculation in the commodity itself, the demand for jewelery (especially out of India) and a host of other factors. The conclusion I came to was that I am not going to make investment in these products part of my investment portfolio as there is too much uncertainty and I do not believe it is possible to get the relevant level of knowledge to invest in these products. If I buy these products they will form part of my 'personal expenditure' on collectible items that I enjoy. Like February 2012, March was a terrible month for keeping up with my expenditure goals for the year. My personal expenditure was too high which meant that the amounts I could allocate to my different savings plans were too low. The big redistribution into shares was from the QBE SPP which I have posted above previously and I do not expect to receive my full allocation so there will be a flow back into my home loan offset account in the next month. The rest of the under investment in the home loan offset account is explained by the over expenditure once again. Next month will be particularly bad for personal expenditure as my credit card bill is very high and I have to pay for some airline tickets as I have booked a holiday for the end of the year. I'm trying to work out ways to increase my income. I will post any ideas or strategies that I have and the results from them. What is a share purchase plan? A share purchase plan (or entitlement offer) is a right given to all existing shareholders in a company to purchase for a defined price extra shares in the company (normally at a significant discount to the current price). This is a cheap way for companies to raise funds from the market as it does often does not involve a full prospectus. Should you participate in a SPP? In a word - yes as long as you have the money and you still believe in the company. This is because if you don't you will have your proportionate shareholding in the company diluted. If you take up your proportionate share at the lower price then you are just as well off. As is pretty evident above this is one of my less successful investments and it was bought while I was university prior to the GFC. I kept it as a reminder to always do my research and also to remember that markets fluctuate a lot so even if you think you're making a good decision some returns will be out of your hands. As luck would have it QBE recently decided to do an equity raising where a shareholder could subscribe for $1000, $2000, $5000, $10000 or $15000 worth of shares at a price of $10.70 subject to a scale back if there was an oversubscription. As I outlined above the way to make money from these investments is to buy a greater than proportionate share of the investment as it will usually trade between the original price and the issue price. For QBE it was even better because post the institutional raising it was trading above the original $12 (it was trading around $13) which gave the investor certainty around profits. Thus by getting my full allocation of shares and selling at market price I would change a $650 loss into a $2,600 profit. Note that any scale back of the investment would reduce this profit but even one share allocated to me would reduce the loss that I currently had. The one big thing to note is that if you don't participate then you are providing the profits for others who do participate. 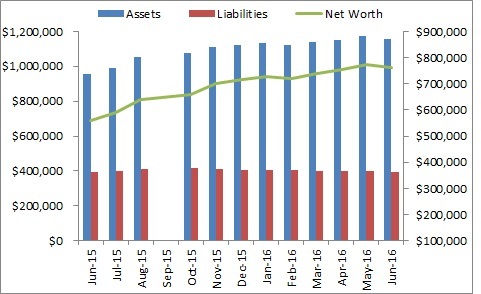 I looked back at my February 2012 net worth and noted that I had predicted negative returns due to my high personal expenditure and it certainly would have resulted in this had I noted had mandated savings / investment plans such as the government mandated superannuation scheme as well as my participation in my company's employee share investment plan. For April I am predicted relatively flat returns once again. My credit card bill will continue to take significant amounts of cash and I have just booked an overseas holiday which I will need to pay for in April. Against this I am forecasting some strong returns from a share purchase plan which I participated in which I will outline in the coming days.